"I believe everyone should have a broad picture of how the universe operates and our place in it. It is a basic human desire. And it also puts our worries into perspective." On Wednesday I was sick. On Thursday I talked a lot. I had a podcast interview and a newspaper interview and then argued with the husband and slept like crap. Today I went to the dentist. Oi. Although I did kind of beat myself up a bit about missing blogging yesterday, I made a goal to blog daily in the month of January, but its not something that I can let run my life especially when I am tired and need to sleep instead. I have not missed a day of yoga so the whole goal wasn't blown and really it wouldn't be the end of the world if it was but its hard to let go sometimes even when I know its for the best. It made me realize that the real issue is time management and not extraneous things that come up. Time management is all about perspective or what kind of mind frame you choose to be in. Today I took a two hour nap after I came home from picking up the last of our WIC checks before going to the dentist. Saying goodbye to the WIC program was rather sad. It means I no longer have such small wee fallas anymore. I am no longer a mother to small children..... It was an end to an era of sorts. So, when I got home finally, I needed to decompress. To readjust my perspective. This weird weather blessed us with temps close to 60 today. My lovely deck in the backyard was calling my name and I listened and heeded that call. 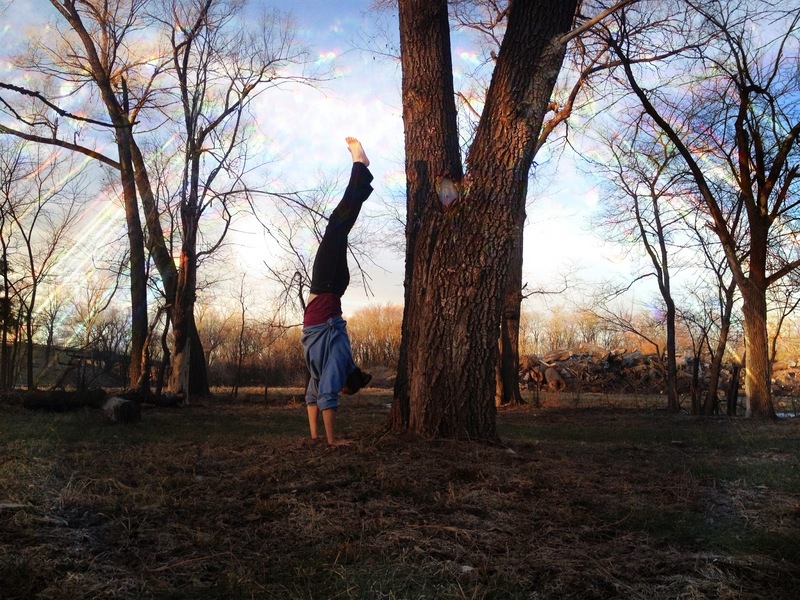 Today's yoga pose was the handstand. I love handstands! 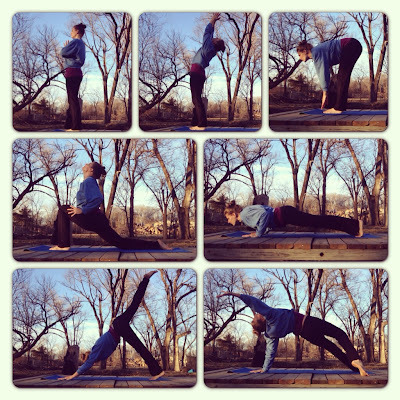 I am working on straightening my back and legs and stacking up my shoulders, hips, and feet. I still have some curve in my back but Im off the tree and held for a couple of breathes! Yay! Did I mention the weather was glorious? I have been struggling with staying focused in the moment. I find myself living my life outside myself as an avoidance thing. I really felt it this afternoon at the dentist when there was nothing I could do but sit and breathe and think. It was uncomfortable and I don't like that I am uncomfortable in my own head. Its not always that way but lately it has been. So I thought about doing yoga and I sent out positive vibes to my dentist. She was so focused and intent on the job at hand and she is so kind and nurturing while she does it. I just love her and appreciate what she does. A sure fire way to get inside your own head again is to flip upside down. 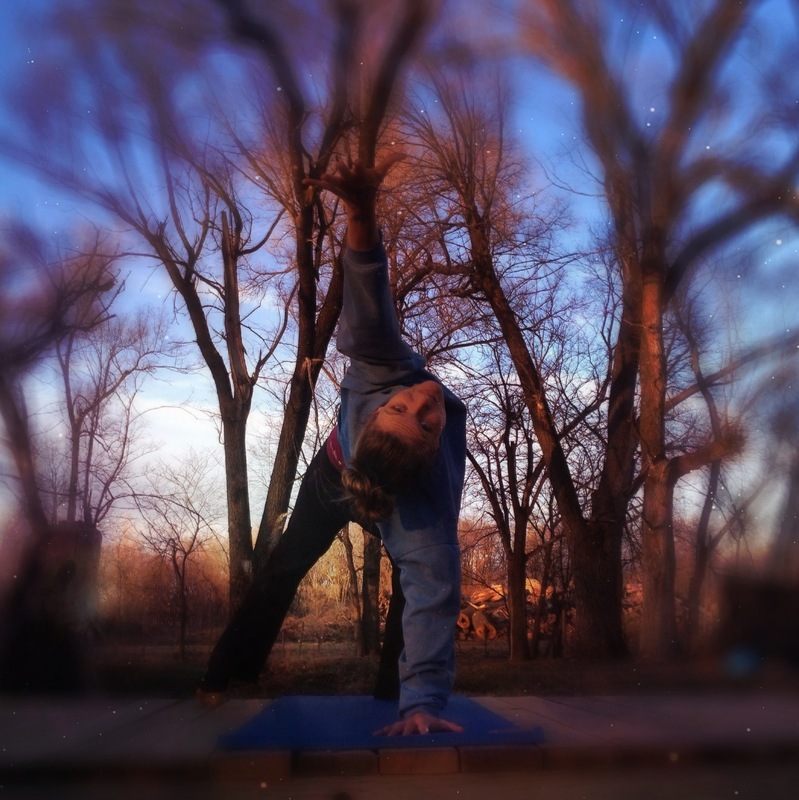 Inversions make me center myself and breathe and focus more so than many of the other asanas. I knew that todays pose was perfect. I am getting used to finding that each pose is just what I needed that day. It wasn't the only thing I worked on but it was the icing on the cake. This is part of the Sun Salutations I was doing. Everything flowed and felt right. I even did my first sorta Flying Pigeon pose which is huge for me since my hips are so tight. I have been working to loosen up my tight ol hips and its paying off. Perspective is such a useful tool. It just takes some bending to change it. Thats what I learned in yoga today. I flipped my dog and turned my frown upside down! Its not easy to change perspective. I struggle with this often especially in my relationship with Jaymon. We are both quite intense people and although we are perfect for each other in many ways it takes work to make it work. I do believe, after testing it out many times, that there are ways to trigger a perspective change and one of them is to get upside down. It just seems to happen. It sets the wheels in motion. And its fun! In the theme of detoxing and cleansing, I find that it detoxes and cleanses my mind. This is yesterdays pose of the day. Bharadvajasana or the pose dedicated to the sage Bharadvaga. Its a deep and challenging twist. In my minds eye I can reach around and grab my foot that is in (wonky) lotus position. For now in reality I can't. Its interesting how there are some poses that I imagine myself doing and yet am scared to try only to find out when I do try that they are something that comes naturally to me while others are ones that I envision and I am surprised at how uncooperative my body is to move that way. I never really know which is which. Tomorrow is all about swim lessons for my little Milo and getting caught up on some computer stuff AND staying in the moment. Keeping my perspective from the inside looking out instead of watching my life unfold like a movie. Namaste.